Lower-Cost iPhone's Plastic Rear Shell Reportedly Surfaces - iPhone.MY - Daily News On Mac, iPhone, iPads, iPods and more! Today, the company shares a photo of what is said to be the rear shell of Apple’s rumored lower-cost iPhone. In line with previous rumors, the part appears to be manufactured from plastic. The part is also consistent with iLounge‘s January description of the device, carrying a design somewhat similar to the iPod classic with a flat back and curved edges, as well as a shift to elongated volume buttons along the left side. The report also shares a number of other claimed details about the device, including word of an A5 chip, a 5-megapixel rear camera, and five color options of black, white, blue, red, and yellow. The device is also claimed to carry a 3.5-inch Retina display rather than the 4-inch display seen in the iPhone 5, although that detail conflicts with reliable analyst Ming-Chi Kuo’s claims of a 4-inch display for the lower-cost iPhone. Finally, Tactus claims that the lower-cost iPhone will launch on October 15 and be priced at $300, although we place little faith in those details given that any source for part leaks likely coming through Apple’s supply chain or accessory manufacturers would not be aware of Apple’s specific launch plans. The report also claims that the rear shell is 0.4-0.6 mm thick, which is obviously not an accurate measurement and is likely a misreporting of previous claims that it would be 0.4-0.6 mm thicker than the iPhone 5. 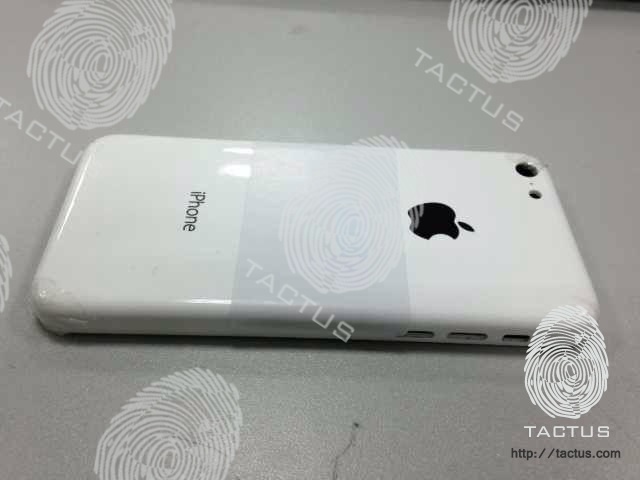 We also can not verify whether this is indeed a legitimate rear shell for Apple’s lower-cost iPhone. It could simply be manufactured based on circulating rumors, but even if fake it could be an accurate representation if it is based on design specs leaking through case makers. Case makers have a number of times created accurate physical mockups of Apple’s upcoming devices, although they have on occasion been incorrect. Finally, the iPhone 4 is coming to Celcom!